In this activity participants explore the bullying dynamic and the roles and behaviors associated with bullying, and identify bullying behavior. Conflict is a normal part of life. Rather than hurt relationships, when conflict is handled productively, it can make relationships healthier and even closer. Bullying, however, is a much different issue. According to bullying expert Dan Olweus, “a person is bullied when he or she is exposed, repeatedly and over time, to negative actions on the part of one or more other persons, and he or she has difficulty defending himself or herself.” Bullying is not conflict; it’s more like abuse. As most bullying incidents occur away from the eyes of adults, creating a culture of caring and intolerance for cruelty of any kind is key to effective interventions. Many schools and programs have agreed-upon terms that are used for the different roles people play (“aggressor”, “victim”, “defender”, etc.) in a bullying situation. While the terms can be helpful in understanding the bullying dynamic, with students we strive to identify the behavior, not the child when dealing with bullying situations (“bullying”, “being bullied”, etc.). This prevents labeling a child in ways that can become detrimental. understand positive choices they can make when they witness or experience bullying. A small smiley-face made from yellow paper. Copy “The Heart of the Matter” visual onto large chart paper. Sing “This Little Light of Mine” or “If I Had a Hammer”. Act out the refrain with agreed upon hand motions. Ask: “What is Bullying?” Write student responses on chart paper. After students have offered their definitions of bullying, share the Dan Olweus definition. If your school district or program uses a particular definition, use it instead. Nacala and Tessa have been friends since kindergarten. Tessa didn’t invite Nacala to her sleepover and Nacala confronts Tessa at recess. “You’re a big jerk,” she says. (Process by asking the group who moved to No why they chose that answer. Point out that while Nacala and Tessa are having a conflict, there is no imbalance of power or repetition to this incident. We hope that they will be able to resolve this conflict by discussing it and go back to being friends. Point to the center of the circle. Say, “The center or the “Heart of the Matter” is where someone is being bullied.” Show students the blue circle that represents the person being bullied. Tape the blue circle onto the center of the circle. (Explain that sometimes there is more than one person being bullied, but often the person is alone.) Ask how this person might be feeling (terrible, embarrassed, afraid). Show students the orange circles that represent the people doing the bullying. Share that there may be only one person doing the bullying, but often there is more than one person. Tape those onto the center as well. Point to the edge of the larger circle. Say, “The Outer Edge is where people are when they are witnessing bullying and they have a choice to make. Are they going to join in and support the people doing the bullying, do nothing, or try to help the person that’s being bullied? People don’t stay here long because bullying usually is a brief (though repeated)incident.” Show students the green and red circles you have made to represent the people on the Outer Edge. Tell students that they are going to be thinking about the behaviors and actions that might happen in these circles. Pair students and have them sit face to face. Give students a minute each to share their ideas with their partners. Ask for a few volunteers to share with the large group. Write their responses on and around the orange circles you have taped on the chart. “Now, we’re going to talk about the people on the Outer Edge, the ones with a choice to make about how to respond.” Put two of the partner pairs together to make a group of four. Give students a few minutes to discuss all the ways that someone on the Outer Edge could respond to the bullying they are witnessing. Have students tape their circles on the Outer Edge. Share responses. What would happen if many people, three or four or even seven people watching the incident made “green” choices? Show this video made by students about how standing up in one small way can make a big difference. Have students draw a picture of themselves on a surfboard in the ocean. Have them write a sentence or two on their picture about a “small act of kindness” they could do for someone being bullied. Post the Waves of Kindness around your room. Read The Smallest Girl in the Smallest Grade by Justin Roberts. “What kinds of behavior is Sally noticing? How does it make her feel? What would you do if you were Sally? What do you think of how she handles the situation?” Continue with The Heart of the Matter as in the grades 2-5 Main Activity, but do as a whole group. Tape green and red circles on the Outer Edge before beginning the lesson. Write students’ ideas as they are shared. Emphasize to younger students the importance of reporting bullying incidence to adults. Younger students will have difficulty distinguishing bullying from conflict, but noticing when someone is being treated unkindly will be the task. Thinking about your school (and beyond including afterschool and social media), in what classes, activities, projects, and events do you find the most incidents of bullying? Thinking about your school (and beyond including afterschool and social media), in what classes, activities, projects, and events do you find the most support and caring? Thinking about your school (and beyond including afterschool and social media), what rules or ways of doing things lead to bullying? Thinking about your school (and beyond including afterschool and social media), what rules or ways of doing things make all people feel cared for and accepted? K-1 Literacy: Read The Juice Box Bully by Bob Sornson. Have students do an opinion continuum in response to the prompt: Do you think having a pledge in our classroom about standing up for each other would work? One end of the line indicates ”really agree” the other end is “really disagree.” Gather students and discuss their thoughts. 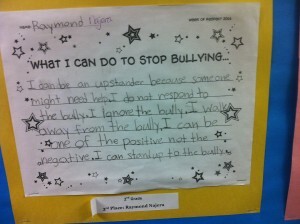 K-5 Literacy: Have students write poems about bullying. Encourage students to write from different points of view (aggressor, target, etc.). With younger students, write a poem together as a class. Use the book King of the Playground by Phyllis Reynolds Naylor to further discuss how to respond to bullies. 2-5 Research, Literacy, Math, Technology: Have students do online research to find information on bullying statistics. Have them choose 3-4 questions to guide their research. (Is bullying more common among girls or boys? Where does it happen? etc.) Use graph paper, chart paper, drawings, or computer programs to share their research. 6-12 Literature: Lois-Ann Yamanaka’s book Wild Meat and the Bully Burgers is the coming of age tale of a 12-year old Japanese-American girl living in Hawaii named Lovey Nariyoshi. Lovey struggles to fit in in a world where it feels important to have “straight blond hair and long Miss America legs.” Use this book as a launching point to discuss the various ways that young people in your school who do not fit in, or are different in some way, are treated. Also explore the role of peer pressure in acts of bullying. 6-12 Math: Have students conduct polls about attitudes towards bullying in your school and present those polls in your student newspaper in graphs and info-graphics. What statistical tests might you apply to this research?